Yellow diamonds offer a great alternative to the more common colorless diamond options and provide a beauty of its own. All diamonds are formed during a long duration deep beneath the earth’s surface, with a process of extremely high temperature and pressure. Color diamonds are created when foreign trace elements form naturally within the crystal structure of the diamond. For yellow diamonds, this element is nitrogen which absorbs the blue light in a diamond thus giving it its yellowish hue. Diamonds can appear in almost every color of the rainbow, with yellow being the most popular and oft-used for jewelry and engagement ring purposes. 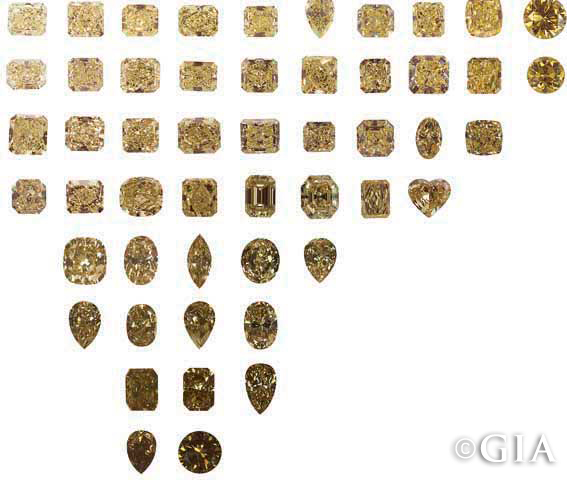 As with all other diamonds, yellow ones are graded based on their saturation level of color. This actually can start in the normal D-Z range used for colorless diamonds, with the grades of ‘U’ through ‘Z’ giving off a faint/light yellow appearance. After it passes the ‘Z’ color grade it moves into the fancy color grading system which goes in this order based on the level of saturation; fancy light yellow, fancy yellow, fancy intense yellow, fancy vivid yellow. As you move left to right fancy light yellow all the way to fancy vivid yellow, the concentration of color in the diamond increases giving it a more distinct appearance. As far as cutting styles, yellow diamonds, and all fancy colors in general, are not cut to the same high standard as their colorless counterparts. The goal with a fancy color diamond is to achieve the most saturated color while maintaining respectable proportions. For this reason many of these stones will be cut relatively deep which is way to bring out its natural hues. 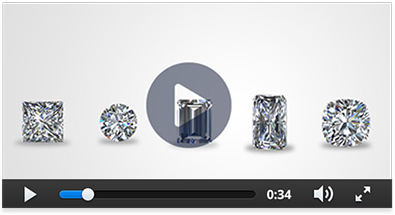 On the other hand, colorless diamonds are cut to maximize sparkle and face-up measurements. Yellow diamonds are in fact more rare than colorless diamonds however that does not mean they are all gong to be more expensive. As a rule of thumb, fancy light yellow and fancy yellow color diamonds will be priced below a colorless diamond of similar quality/shape/size while a fancy intense or fancy vivid diamond will be above. The rarity increases exponentially as you reach the intense/vivid yellow color range which makes them sell at a high premium. Yellow diamonds are versatile and look good in any array of engagement ring designs. Three-stone rings like the one above look great as the yellow center diamond and colorless side diamonds form a beautiful contrast. Halo designs work great as well with the same contrast forming between the center diamond and the surrounding pave stones. For almost all our yellow diamond engagement rings we will set the center-stone in yellow gold prongs to help intensify its color. In some instances, for lighter yellow colors we can add a subtle 18 karat yellow gold cup underneath the center-stone to help reflect more color into the stone. For more yellow diamond engagement rings from our collection check out our website here. All our handmade ring designs can be custom made for any type of center-stone including color diamonds. For our full collection of color center-stone rings check out our engagement ring gallery here.